Engaged, enchanted and enjoying the fun, this couple celebrates a sweet beginning ... and a future as bright as their big, dazzling diamond! Adorably detailed with sparkling glitter accents, this snow couple's heart declares the happy news: "Engaged!". We'll personalize with 2 names and any year, creating a merry memento they'll cherish forever. Specify 2 names; limit 1 line, 8 letters/spaces each. Specify year; limit 4 characters. Resin. 3 1/4" long x 3" high. I ordered four personalized Christmas ornaments. Each ornament was absolutely beautiful! I was very pleased with my purchases and will use Miles Kimball again. They did a great job on my order! I am so pleased with this ornament! It is super cute and much higher quality than I expected. The picture in the catalog doesn't do it justice. My son just got engaged and I'm giving it to them for their first ornament as a couple. I think they will love it! Very Very cute. Still have it. Have not given it to the couple yet. I loved this ornament when I viewed it online, and it's even nicer than pictured! The personalization was a wonderful bonus. a gift for my son and future daughter-in-law. they are going to love it! Personalization was perfect and will be a treasured keepsake of theirs for many years to come! 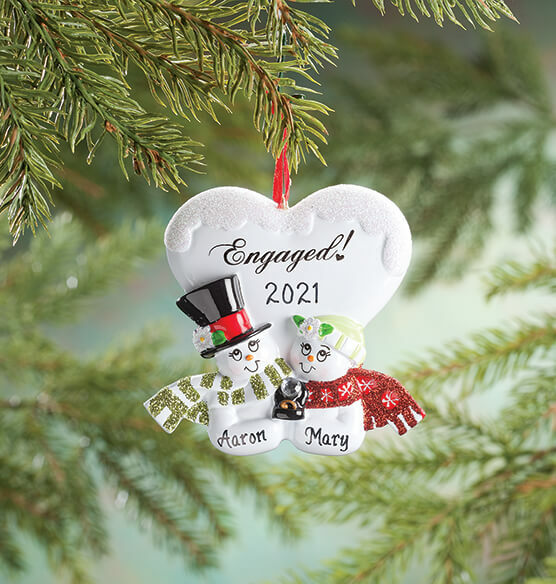 I hope maybe there will be a snowman themed wedding ornament available next year ? Love snowmen and this was the perfect ornament for my engaged son and his fiancé! can you have who its from on the back? BEST ANSWER: I don't think they do custom personalizations like that here but I have used a fine-tip sharpie to write a personal note on the back of other ornaments like this, though not this particular ornament. Be sure to let it dry completely before you handle the ornament or wrap it, so it won't smudge. Thank you for your question. We do not personalize the back of this ornament. We hope this information will be of help to you.